Britain's Olympic heroes are set for even more medals when they are showered with honours after our greatest Games performance in 108 years. As the Rio Games ended with a blaze of fireworks, Downing Street indicated today that gongs will be handed out for Team GB’s achievements. And Government officials revealed there will be no cap on the number of athletes who can be recognised in the Queen's New Year's Honours list. It came as the Queen sent her “warmest congratulations”. UK athletes scooped 67 medals – 27 gold, 23 silver, and 17 bronze – a national record for Games overseas and beat the 65 won at London 2012. No other nation has increased its medal tally after hosting the Games and the performance is only second to the London Games of 1908. Britain took second place to the USA in the medals table, relegating China to third place. Theresa May's spokeswoman said the Prime Minister was “extremely proud”, adding: “We have had an amazing fortnight and should be looking at ways we can reward the athletes. “Honours are there to recognise and reward people. There is no formal cap on the number of honours that can be awarded. 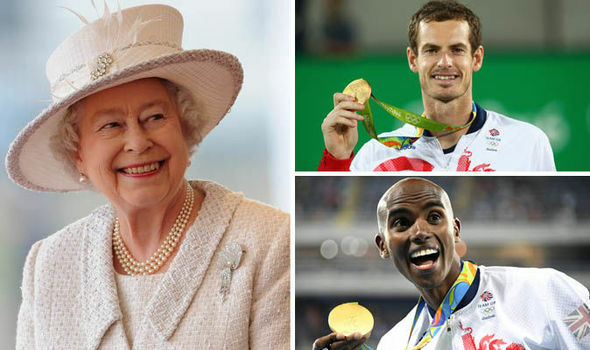 Three athletes are tipped for knighthoods – Mo Farah, who won gold in the 5,000 metres and 10,000 metres, cyclist Jason Kenny, who has six gold medals, and double gold-winning tennis star Andy Murray. Kenny's fiancee Laura Trott, who has four cycling gold medals from two Games, is tipped to become a Dame. Others likely to be honoured include gymnast Max Whitlock, showjumper Nick Skelton, and rower Katherine Grainger. The Duke and Duchess of Cambridge and Prince Harry added their congratulations. In a message to Team GB, they said: “You have made the entire country proud. At a glittering closing ceremony in Rio’s Maracana stadium on Sunday, the Olympic baton was passed to 2020 host Tokyo. Athletes from 207 nations partied to a samba beat while a spectacular firework display closed the ceremony, in which Japanese premier Shinzo Abe was dressed as computer game character Super Mario. The UK athletes were flying home last night on a BA jet decorated with a gold nose and the name “victoRIOus”.